Update: edited for formatting and to add Baby2’s birth stats and some more details. Never too soon to chalk that up to mama brain, right? First, thank you everyone for your comments on my last post! My heart swelled with your kind words and well wishes. Each one made our day that much more special. Thank you for keeping me in your thoughts as we awaited the birth of our daughter! And oh my, what a birth it was. First, let’s go back to Tuesday’s midwife appointment (which I wrote about Tuesday night but had scheduled to post Wednesday morning, which just happened to be hours after our delivery!). She said that, based on Baby2’s positioning, my labor would likely start with my water breaking and then be intense and quick. It started early on Wednesday, July 19th. I woke up to go to the bathroom a little after 4:30 AM, which is very normal for me lately. I went back to bed and tried to fall asleep, but I couldn’t (which had been normal for the last couple weeks). Suddenly I heard The Pop. The Pop I had read about in other birth stories. The Pop of my water breaking. I thought, nah, that probably wasn’t it, but seconds later I felt a trickle of warm fluid. I ran to the bathroom to avoid soiling the sheets (and I totally made it down the hall and to the toilet without leaking! Score!). After I drained for a bit, I went back to bed to rest before things got going. Mr. Handsome had just woken up a few minutes ago, but I didn’t tell him my water had broken until I had the first contraction. I quickly had three contractions in less than 10 minutes. Mr. Handsome could hear me breathing through them and asked if it was time to go. The clock said 5 AM and I realized things were happening fast. Time to pack up Kiddo1 and get going. I got dressed and went to the bathroom a couple more times. The contractions were already super intense and I had to vocalize through them. I knew I needed some food in me, so I went to scramble some eggs (it seemed totally sane at the time!). Kiddo1 got ready with a quickness (luckily his bag was already packed and in the car!). He found me in the kitchen hunched over the counter, trying so hard not to scare him with my moaning, but probably failing. I finished making my eggs and had to ask Mr. Handsome for a to-go container. I was already so out-of-it I couldn’t find the containers that I had reached for every morning to pack up my eggs for work. Yikes. I remember the next contraction dropped me to the floor and I pounded my fist and yelled out. Yelled. Loud. I felt the sensation of pushing. And I didn’t fight it, I pushed with each contraction from then on out. Mr. Handsome moved with lighting speed after that! We piled in the car and took off for Kiddo1’s friend’s family’s house who, luckily, had answered the phone and agreed to take our child and lives about a minute down the street from us. We are forever in their debt for responding so quickly and keeping our son safe and occupied! We dropped him off fast and headed toward the hospital. It was about 5:45. Mr. Handsome was so amazing. As I was somehow knelt on all fours in the third-row seat of our van (one leg on the bench seat, one leg on the floor, head toward the window grasping the seat belt and pulling on it with each contraction) he was driving us the six miles to the hospital. He asked if I wanted to stop at the hospital-affiliated clinic that is on the way. I told him to just keep going to the hospital (the clinic was probably closed anyway). The contractions still made me push, but they had slowed down. Because of that, I knew this was happening. Now. We arrived at the hospital just before 6 – Mr. Handsome got us there in 10 flat minutes which was amazing! He later told me he ran three red lights to do it, but I was so grateful that he did! As we pulled up a contraction was starting. I finished it and we walked in together from the loading zone, where he left the car. I had a contraction in the lobby that I was able to stand through, as he explained to the front desk that I was indeed in labor and needed to get to labor & delivery, stat. They brought a wheelchair but there was no way I was sitting down! So they ushered us toward the elevator. When we got to the L&D floor, I dropped to all fours again with another intense contraction while Mr. Handsome ran to find a nurse. I finished my contraction, got up and started wandering down the hall. I heard my name called behind me and saw Mr. Handsome and a nurse approaching with another wheelchair, which I refused again. The delivery room was right around the corner. When we got in the delivery room I dropped my bag and literally crawled on to the bed. The nurse asked if she could check my cervix, but I told her she probably didn’t need to. I could feel the head crowning. A fury of people entered the room. I heard a doctor introduce himself, who I believe I gave the thumbs up to. The midwife on call was rushing from another delivery. Another contraction, another push. More fury in the room. I heard Mr. Handsome say that we were interested in the waterbirth option (how freaking sweet is he?!) and a nurse (and I?) respond that there wasn’t time for that now! Another contraction, and I knew this was it. I pushed hard and felt the ring of fire, so I backed off. How I was able to back off I don’t know, but I really didn’t want to tear! Another contraction, and I pushed. I heard people tell me to push, but I didn’t need any direction. I felt her head emerge, I pushed again, I felt her shoulders. She was born at 6:13 am, less than 20 minutes after we arrived at the hospital. The midwife arrived 10 minutes later, so apologetic, but honestly, all I needed was someone to catch and I didn’t care who that was! I couldn’t see her! I wanted to see but I couldn’t figure out how to flip over from my all-fours position. 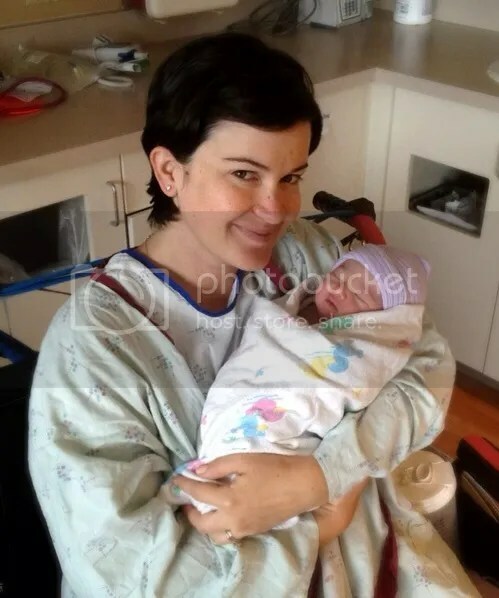 A nurse said something about skin-to-skin and I quickly ripped off all my clothes (that stretchy Old Navy skirt came in handy! It went right over my head). Mr. Handsome and a nurse helped me turn over and my daughter was placed on my chest. I looked at her, she was amazing. Mr. Handsome and I both said that she looks exactly like her brother did when he was born. The spitting image – it’s completely amazing! I looked at the clock and realized all that happened in about an hour and a half and my mouth fell open. Oh my goodness, what just happened?! The cord blood donation process happened quickly. The nurses were so amazing. The placenta came out quickly and a nurse asked if we wanted a placenta tour. I declined but Mr. Handsome was all over it! He finds this birth thing just fascinating. The next two hours in the delivery room were a blur. Our daughter was here and she looked amazing. She came out perfectly pink, she was alert, she was completely healthy. She started to nurse about an hour after she was born and she ate for a solid hour. When she was done the nurses took her stats and APGARs (6 pounds, 8.8 ounces, 19 inches and perfect scores) then we were packed up to recovery and met more incredible nurses. In the end, my GBS positive status didn’t matter at all. Of course I didn’t get a drop of antibiotics, but Baby2 didn’t show any signs of infection whatsoever. She did so great on all her tests that we were released a mere 30 hours after we had arrived (GBS positive births require a stay of 48 hours). We’ve been home for 27 hours now and life could not be any more perfect. Mr. Handsome is my knight in shining armor, Kiddo1 is so excited and helpful, Max is slowly taking in her smell and getting used to having a new little one to watch. Our family feels so perfect. We’re all so very happy! 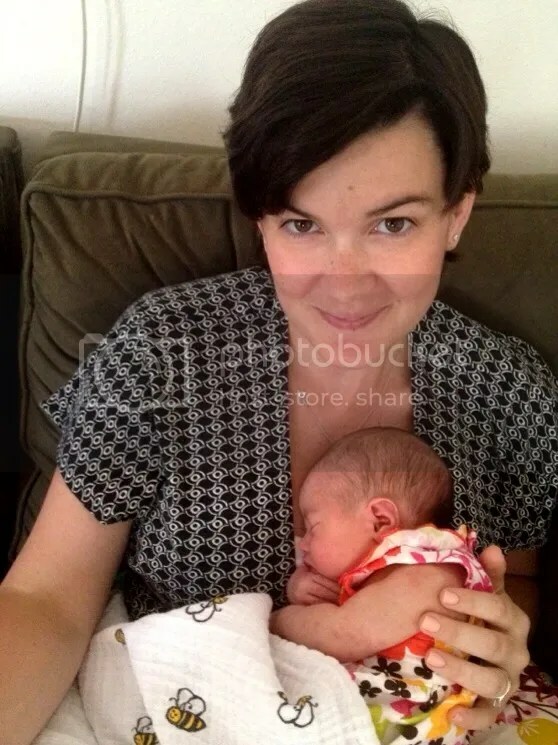 Posted in Birth Story and tagged birth story, breastfeeding, med-free birth, midwife, minivan. Bookmark the permalink. This book was recommended to me by a member of my Moms Group. 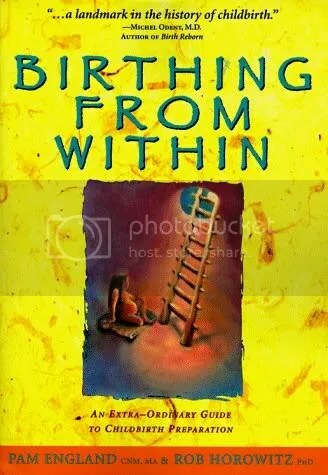 When I heard the title I knew I had to read it, as I am planning a natural hospital birth myself. I was a little afraid the book would make me start to feel really combative about how we would have to deal with the hospital in order to get our natural birth. Over the last few weeks, I have identified that my biggest fear about birth isn’t that I can’t do it, it’s that hospital staff will somehow mess it up for me by not following my wishes. Much to my surprise, though, this book doesn’t encourage confrontation with staff. Ms. Gabriel emphasizes a calm but firm approach, one that allows the staff to see your confidence in and commitment to natural birth. One of her biggest strategies for avoiding interventions is using the phrase, “I think we’ll wait an hour.” It isn’t rejecting the staff’s ideas or being combative, rather it’s a keen delay mechanism that often allows time for whatever they feel needs resolution to resolve itself. For example, if the staff is pushing Pitocin because of an inactive labor, one hour could be all you need to really get in the groove of things. And if one hour doesn’t work, ask for another. Staff may try to guilt-trip you into seeing things their way, but hold your ground and they’ll see your commitment to natural birth. One of the great things about this book is the assistance in writing one’s birth plan. I had no idea that birth plans can be controversial: apparently some practitioners discourage them because they don’t want their patients to get “too attached” to a specific plan. Ms. Gabriel is a big advocate of plans, though, as long as you understand that plans change and you keep your “hospital version” short and sweet. Ms. Gabriel recommends three versions of your plan: a dream version, a realistic version and a hospital version. 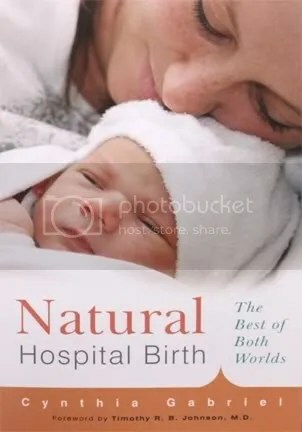 The hospital version should basically say, “I want the most natural birth possible.” I’ve been inspired to finally start to writing down elements of my ideal plan and get working with Mr. Handsome, too, to make sure we’re on the same page. Plus, I’m asking Mr. Handsome to read this book, too. It’s great that I have all the information about obtaining a natural birth in a hospital, but there’s only so much I’ll be able to do during “the throws” of labor. Mr. Handsome is my advocate so he not only needs to live and breathe our birth plan as much as me (maybe even more so!) but he needs to know the strategies presented in this book in order to get what we want out of this birth. Poor guy, his prescribed reading list is getting longer and longer! I’m not as nervous about the hospital staff failing me after reading this book. I think there are things we need to do to prepare ourselves for trying to achieve a natural birth in a hospital setting. I have confidence in myself and in Mr. Handsome that we can convey our commitment to natural birth and have things the way we want them. I know circumstances can change and some things are just out of our control, but I feel like we will have a handle on ensuring that we have the most natural (and enjoyable!) birth possible. Posted in Body Care and tagged birth prep, books, delivery prep, med-free birth, natural birth. Bookmark the permalink. As you may know, I’m very interested in pursuing a waterbirth so, naturally, I’m reading up about it in order to prepare myself and Mr. Handsome. The first book I read, Choosing Waterbirth, was a great primer and helped prepare the emotional side of my brain for this experience. This next book, however, took my preparation to a whole new level. 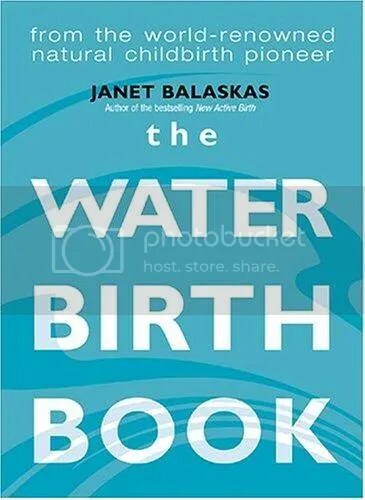 Much like her book Active Birth, The Waterbirth Book, by Janet Balaskas, is a comprehensive account of every detail of waterbirth that I could possible thing of, and then some. Ms. Balaskas not only goes over a brief history of waterbirth, cultural uses of water during birth and pain management using water, but she also walks the reader through every stage of water labor and delivery. Any question that was lingering in my mind after reading Choosing Waterbirth has now been answered. Now I’m only left with a list of questions for the hospital about their policies. And an incredible excitement for what we could experience with this birth plan! When do you fill up the pool? When we call to say we’re coming in (based on our assumed progress/timing of contractions)? When we get there and progress has been assessed? How long does it take to fill the pool? How is water temperature regulated? At what point during labor is the appropriate time to get in the pool? (The book says 5-6 cm dilated, before transition.) Is there a point at which “the window closes” and it’s too late to get in? What things would cause you to ask a woman to leave the pool? How do you manage fetal monitoring? How often do you monitor? Are partners allowed in the pool? During all stages? Finally, the big one, will you let Mr. Handsome “catch” and bring our baby up to the surface?! See, Ms. Balaskas gives you a whole lot of ammo to make sure you’re fully comfortable with hospital policies regarding waterbirth. I’m totally going to rock our class (coming up in June). There’s also some great tidbits in here from Active Birth; not so much from a physioloical perspective, more like the reiteration that movement and staying upright is helpful whether on “dry land” or in the water. She also points out that the pool actually facilitates movement as you’re less inclined to get into bed and have greater freedom of motion (one of the birth story quotes talked about being able to move quickly from an all-fours position to a squat which is quite a feat on dry land). Plus you’re in your own little bubble where you can be free to concentrate inward which is a major bonus for me. Choosing Waterbirth was a great book but there’s nothing in it that The Waterbirth Book doesn’t have, plus it has a whole lot more. If you can only read one book about waterbirth, make it this one by Janet Balaskas! Posted in Book Review, Delivery Prep and tagged birth prep, books, delivery prep, fetal development, med-free birth, midwife, waterbirth. Bookmark the permalink.